Albatrosses are a family of large seabirds that can be found throughout the Southern Ocean and the North Pacific Ocean. It is generally accepted that there are 21 species of albatrosses that have been identified, although there is debate about the exact number of species. They are some of the largest flying birds in the world. The great albatrosses have wingspans which can reach 3.7 m (12 feet). 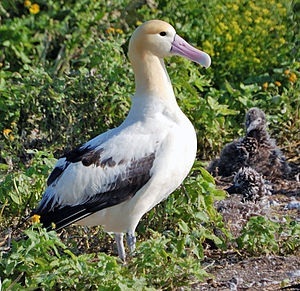 Albatrosses mostly nest on remote ocean islands and it is not uncommon for a number of species to nest together. Of the 21 species of albatrosses, 19 are listed as threatened with extinction. Let’s find out why the population of these magnificent birds is declining and why they are endangered. Albatrosses have long been hunted, for their feathers, food or simply sport, and this was really the first threat to these birds. The feather trade was the most damaging of these practices and the Short-tailed Albatross was almost hunted to extinction by feather harvesters. Today the greatest threat to albatrosses is commercial long-line fishing. These lines feature set baits which attract the albatrosses and when the birds feed on the bait they become hooked on the line and they drown. It is estimated that up to 100,000 birds are killed each year by long-line fishing. Another great threat to these birds is introduced species. Rats and feral cats can decimate the population by attacking the birds, chicks or the eggs. Albatrosses have never encountered these types of mammals and cannot protect themselves, or their young, against such attacks. Ocean pollution is also a threat the these birds. They ingest plastic that is floating on the water and it is impossible to digest, which causes obstruction of their digestive system. The first step in protecting these birds is to help educate fishermen and find solutions to the problem of long-line fishing. Simply setting the bait at night can reduce the damage considerably, but other options include dying the bait blue, setting the bait deeper and finding a way to scare the birds away from the bait. It is also important that breeding islands are protected and the introduced species are removed.